Something fresh is always happening at the Stanislavsky. Between their new additions, the Grigorovich ballets, the classical repertoire, and the upcoming Balanchine premiere, the troupe is constantly engaged in developing their talents in both classical and modern works. One contemporary programme that debuted in April 2018 reappeared this past weekend, in late September. The triple bill with Dmitry Briantsev's Illusive Ball, Marco Goecke's Lonesome George, and Ohad Naharin's clever Minus 16 drew a full house at start of the season. Briantsev, a name little-known outside of Russia, is a classical genius who previously held the post of artistic director at the Stanislavsky Ballet, a post that Laurent Hilaire now holds. Briantsev disappeared in 2004 while on business in Prague at the age of 57, not returning to for his ballet season as planned, and he has not been seen since. His ballet, Illusive Ball, (referred to as "Spirit Ball" in the New York Times), is a short work set on five couples against three walls of diaphanous drapes in dim lighting. 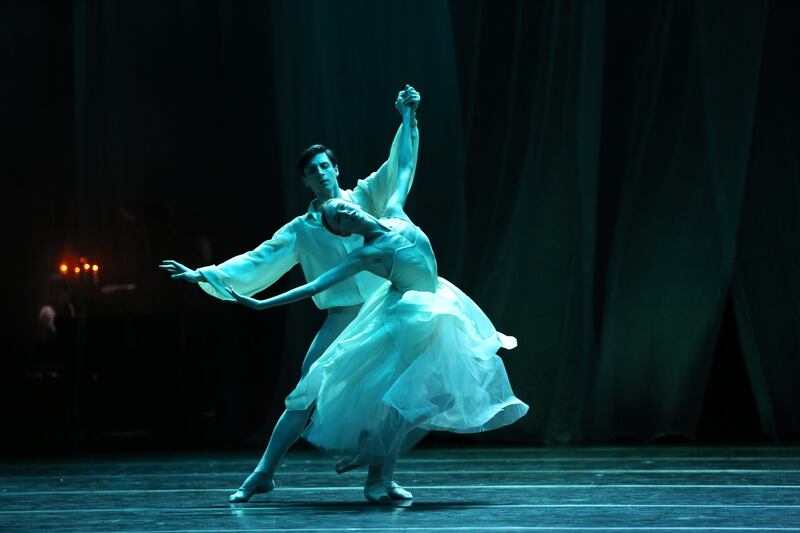 The pairs waltz at a slower-than-adagio pace to the infectiously haunting notes of Frederic Chopin under the sublime conducting of Roman Kaloshin with Anna Malysheva at the upstage piano, the women in long romantic tutus, the men in simple shirts and tights. While everyone on stage may in fact be a phantom, judging from the choreography it is the ladies who are the phantoms, and the men who chase them. Or perhaps, we are witnessing a group of ethereal beings who, having left the world, in fact never left at all, continuing to twirl slowly in the ballroom. The five duets are highlighted by pastel hues -- pink, blue, purple, etc-- interspersed with ensemble sections in which the room fills again with the slow moving waltzers. In the first duet, Ksenia Shevtsova bends in a penchée behind Georgi Smilevsky, later floating in a sylph-like position as he lifts her across the floor. Valeria Mykhanova and Aleksey Liubimov performed the second duet, her double glissade and garguillade smooth and precise. Elena Solomyanko debuted in the third duet, performing sweeping ronds en l'air in her duet with Denis Dmitriev, demonstrating sharpness in sissones before the twoperformed a series of arabesque pliés in unison, later echoing the "sylph" lift of the first pair. Natalya Somova and Sergey Manuilov shifted the mood to something more dramatic, as he flipped her upside down over his shoulder to the peaks in the music. The final duet with Oksana Kardash and Ivan Mikhailyov proved to be the warmest of the five, as she bourréed away from him only to be magnetically drawn backwards, falling to her knees. His insistent pirouettes in a short solo soon pulled her back to the floor --a common theme in their duet-- and the two ended their interlude as they began, facing each other, her chin nearly on his shoulder. The difficult-to-categorize Lonesome George, set on a barren black stage, is German industrialism meets Proustian angst. The shirtless men who perform both in isolation and in groups imply oppressive foreboding or anxiety through fast-flapping hands and elbows that accent every movement. Edges, angles and abrupt motions rule the choreographic landscape, lending a busy, jerky, yet empty effect. The Shostakovich score (Symphony quartet no. 8 in C major opus 110 a) at times implies the urgency of a train station. Only Oksana Kardash suddenly demonstrated a wave of the arms that infused a fleeting moment of lyricism in an otherwise abstractly cold setting. The sudden "rain" of silver streamers that fall from the ceiling seem mere decor against the visual, existentialist commentary on the loneliness of man. The most refreshing moment came in a solo by Max Sevagin whose sharp movements were soon overtaken by incessant itching, glissades forward, and loud kisses blown to the audience. The dancers make sounds in this piece, but that tiny distraction only adds to the sense that everyone wants to be seen and heard, and yet there is no communion, message, or rescue from the solitude of the soul. The mood and pace increased with Ohad Naharin's Minus 16 in an upbeat end to the evening. Most audience members didn't realize the work had already begun while intermission had not yet ended: Max Sevagin reappeared on stage, this time in a brilliant solo that revealed the depths of his ability to carry the audience in the palm of his hand. Suave grace in a split jeté in second, and then a series of brisk fouettés and the utmost musicality won applause and caused a heartfelt grin to emerge on his face. But the ballet truly "begins" shortly thereafter, with 18 dancers seated in chairs in a semi-circle, performing a "wave" and then shouting the chorus along with the mixture of recorded music. As they first throw their jackets, then their shoes, pants, and shirts into the center of the arena, the "wave" repeats. No particular storyline follows, but the shift to electronic music and black hats for all lead to everyone jumping and kicking in a fast jam to club-like music. From there, the dancers filed into the audience and selected viewers to come on stage and dance. With the new additions, the atmosphere became warmer, more intimate, and excitedly lively. After a solo from an elderly grandmother thrilled to be in the spotlight and the ensuing laughter from the audience, the newcomers returned to their seats, the cast returned to the fast club jam, and the audience exploded into applause. Not the type of ending one would expect in a classical ballet theatre, but addictively enjoyable and memorable in any case. This contagious atmosphere is what continues to fill the hall of the Stanislavsky every night. This, their 100th anniversary season, is already on fire. All photos credit to Sila Avvakum, resident photographer at the Stanislavsky Theatre.